Let the cookie baking season begin! Not like I needed the Holidays to bake cookies, but it seems a bit more fun during the Christmas season doesn’t it? 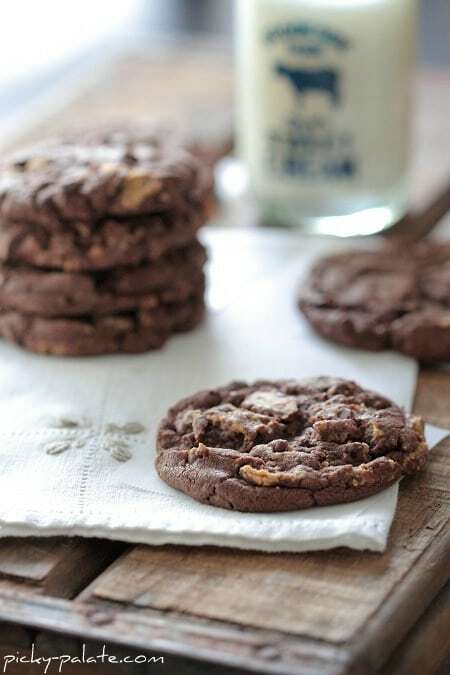 This is a simple, one bowl chocolate lovers cookie that is perfect for any Christmas plate. Your friends and neighbors will LOVE you when these are given as gifts. Here is your 5 ingredient line up, can’t beat that! 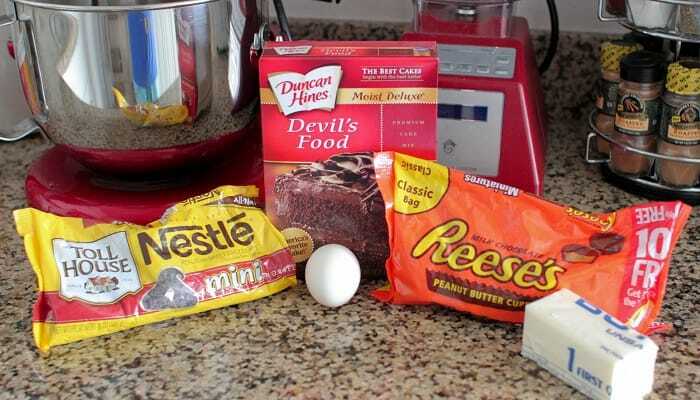 In no particular order, place your ingredients into a large mixing bowl. I started with the cake mix. Pour in your melted butter. 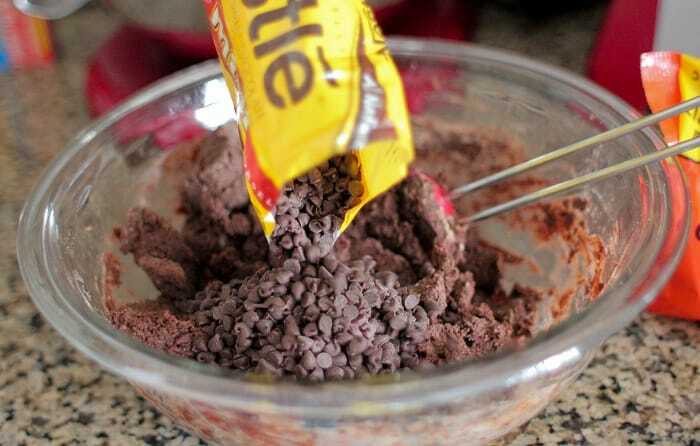 Add your chocolate chips. I chose the mini’s. 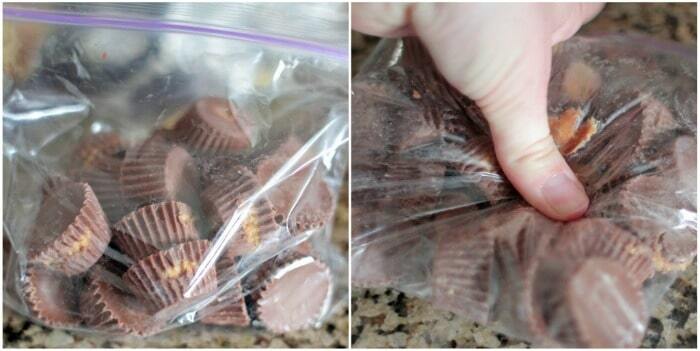 Time for the Reeses Peanut Butter Cups. Place 25 of them in a ziplock bag and give them a good smash. 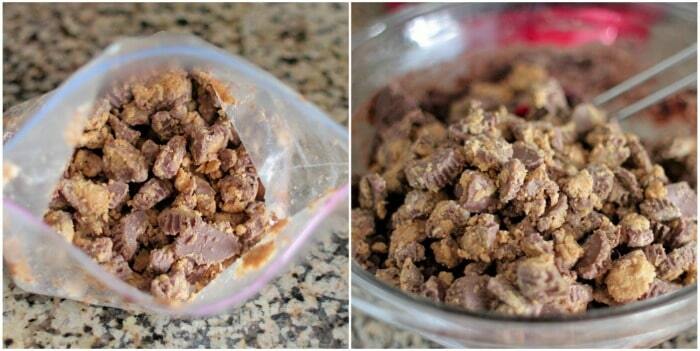 Once smashed, add them right to the bowl. 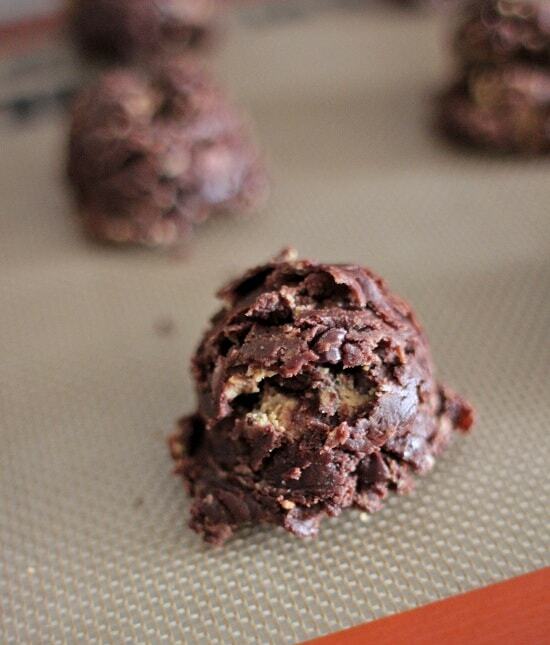 Scoop onto your cookie sheet. With your fingers, press each cookie down about 1/2 inch. Perfect little cookie if I don’t say so myself 🙂 Enjoy! 1. Preheat oven to 350 degrees F. and line a large baking sheet with parchment or a silpat liner. 2. 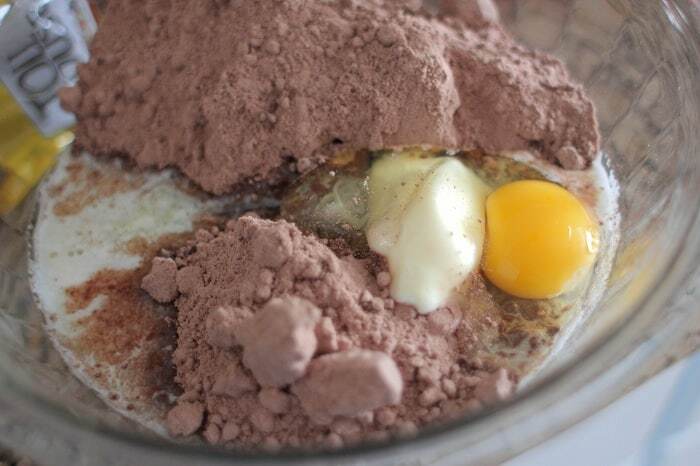 Place all ingredients into a large bowl mixing until combined. I find it easiest to mix with hands. If dough seems too dry, you can add 2 additional Tablespoons melted butter. With a medium cookie scoop, scoop dough onto baking sheet placed 1 inch apart. Bake for 13-15 minutes until cooked through. Let cool for 10 minutes on baking sheet before transferring to cooling rack. Frozen Hot Chocolate, Serendipity Style! These sound divine! I bet they are really rich too, but that’s okay! I love chocolate and peanut butter, especially Reese’s cups. 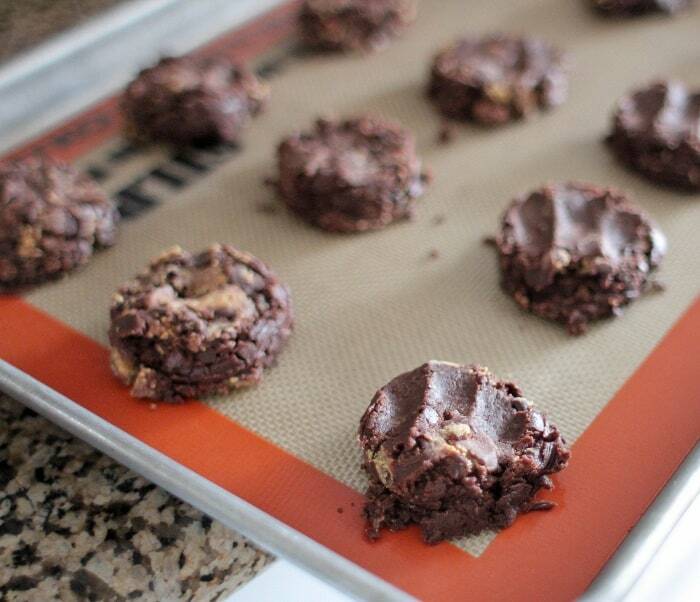 If I made these the dough wouldn’t even make it to the cookie sheet! Had to read this title multiple times…because my head was spinning! LOVE IT! I do have a history of long titles, my sister gives me a hard time for that, lol! These sound so yummy! I love the cake batter idea. Awesome. This cookie looks so good! 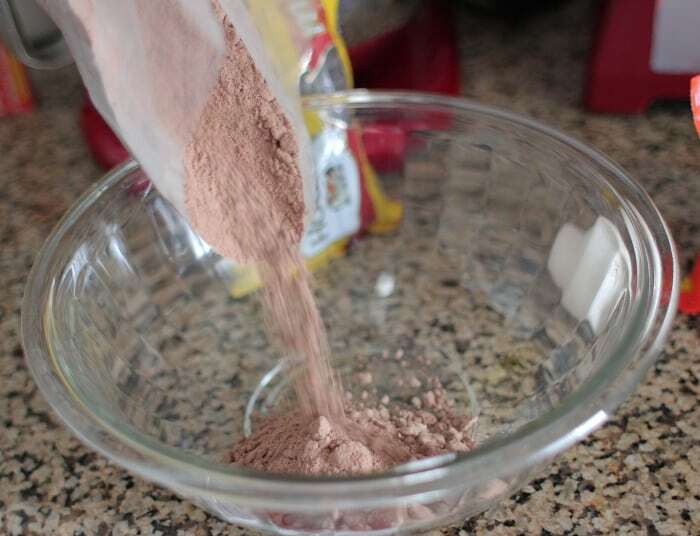 And made extra simple with boxed cake mix. Great recipe! Lol! The raw dough is totally deadly! PB and chocolate-always a good choice! You make some of the best cookies! Love these. I am ALL over these! Yum! ahh, love it! reese’s are my FAVORITE!! YUM! I have it all on hand except the cake mix! Now I know what I’ll be making for Monday’s cookie exchange! Wow! These look wonderful. I love Reese’s! 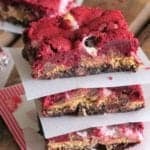 Can you suggest a substition for the Peanut Butter Cups? Im just not a PB fan but would love to make a variation of these. Try peppermint patties or Rolo’s. 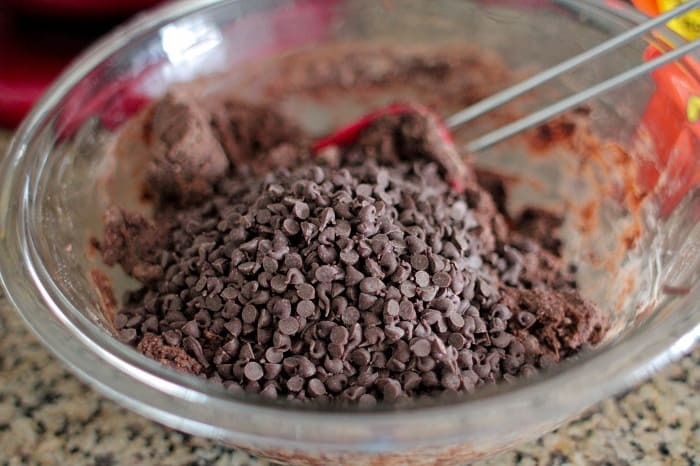 The best place to get the Nestle chocolate chips is Costco, so cheap there! These cookies look absolutely delicious! And I love the convenience of starting with a cake mix. Great recipe. these are mouthwatering. I can’t wait to try this recipe! How easy are these? And they look absolutely perfect!! 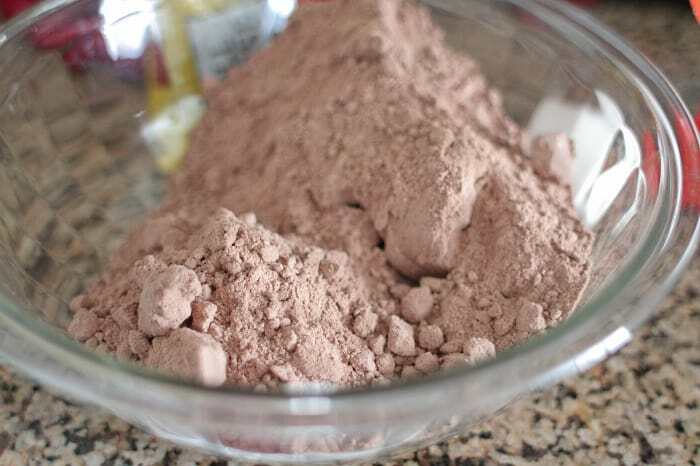 i have seen several cookie recipes calling for cake mix but none look and beautiful as yours. 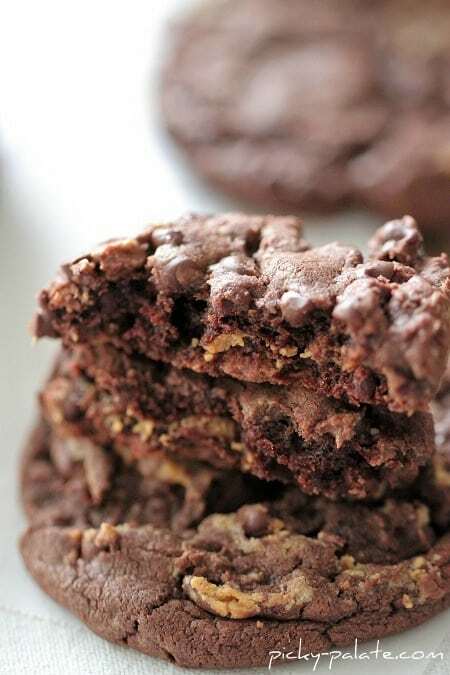 Adding the chocolate bits and crushed peanut butter cups make these cookies absolutely irresistible! Can I have these for lunch instead of what I brought to the office??? You have no idea how happy these cookies make me 🙂 These cookies are calling my name. oh how i hate you for posting this. i am about to have a chocolate attack and hurt somebody at my office if i don’t get some chocolate. hahah. yumm. love cake mix cookies!!! def going to make these!!! I don’t dare make these or I will hide them from my family and eat them all! They look delicious. 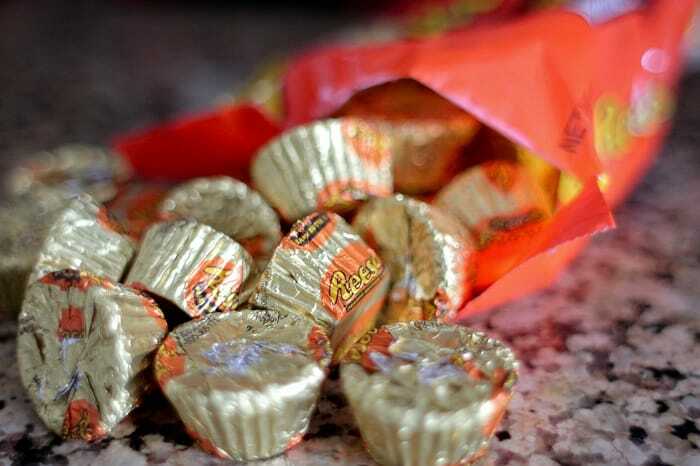 You just can’t go wrong with Reese’s. My husband would love these! His two favorite things chocolate and peanut butter. I love cookies made from cake mix. The texture is the best. This is a great combination! 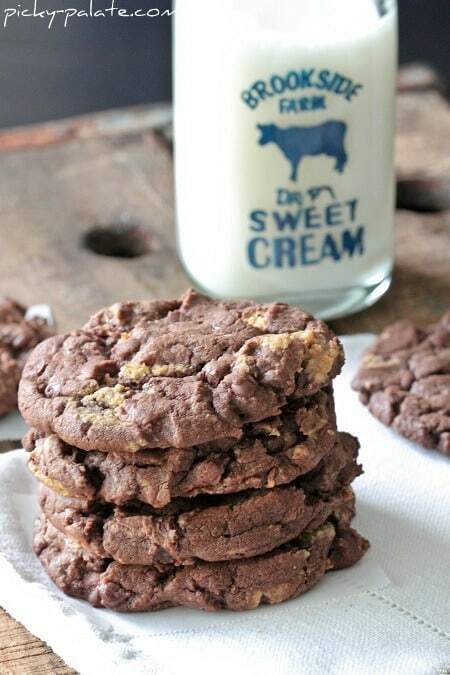 Devil’s Food Cake mix cookies are the best. They stay so moist and lend themselves to so many additions. Love this recipe. I made a variation once with cream cheese mixed in and absolutely loved them. Thanks! I made them today, and my dough was really crumbly too. I added 2 T more butter and it held together much better. My 9 yr old taste tester declared them better than a Snickers, and that’s really high praise from her! My goodness… These look amazing! And so simple! Definitely part of my cookie box this year. I must try these! They look so good! LOVE! 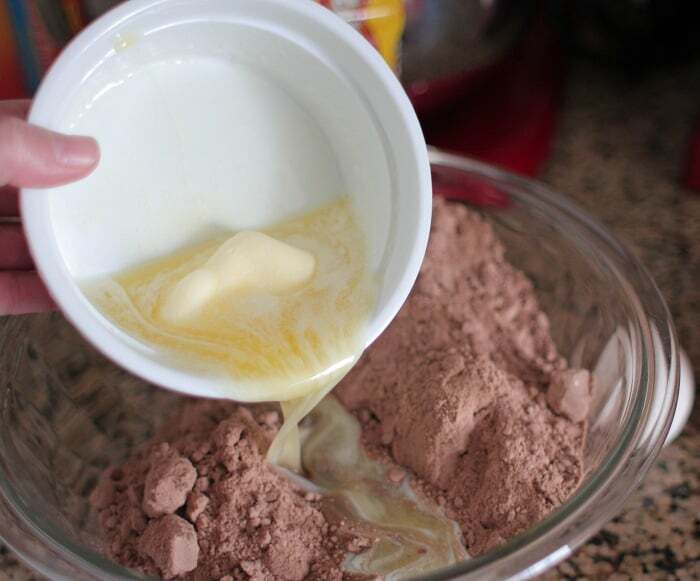 Such a time saver, using cake batter. 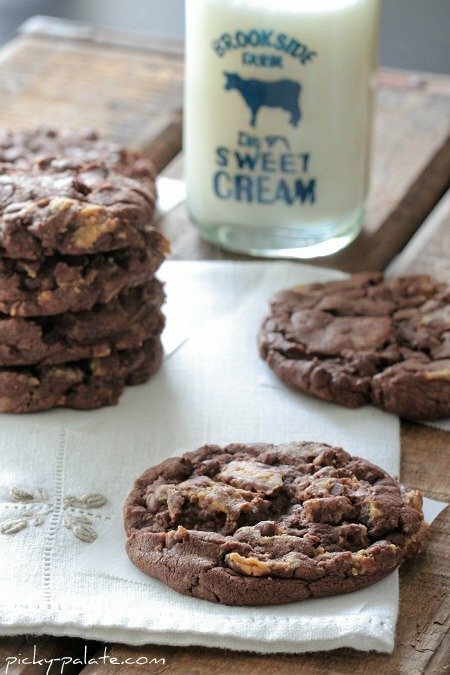 Those cookies are so drool-worthy!! does anyone have a recipe for the cookie part that’s not a mix? I have allergies, but I would love a moist chocolate cookie recipe for this. thanks! I always love your cookie creations!! Wow as always, these look glorious! You never seize to amaze me with goodness! So gonna make these for my neighbor/friend Christmas plates this year. They just look way to good not to!! You are the cookie queen. Dessert queen. Anything sweet guru. These look delicious, Jenny!